The photographic image as a wall creates an invitation to suspend reality and enter another world. This vast sense of scale is the first element to a work; the second element withdraws that invitation by hanging other framed photographs on top of the surface of the photo-wall. The framed images add another layer that plays with dimensional space. Visually and emotionally - this creates an oscillation that only comes toward a resolution via the content relationship between the large wall image and the smaller framed image(s). What happens in these relationships is the opportunity for both great spatial and conceptual dynamics - and the main thrust of the art. Furthermore, the custom shapes of the framed work(s) help focus the viewer toward a specific meaning to the overall piece. Recent works handle a battery of large social themes (equal rights, new-agism, information control, sexual tourism) in a light manner. Whether the ultimate read is one of play or menace, the result maintains a poppish demeanor while still upholding a social issue within wider consciousness. 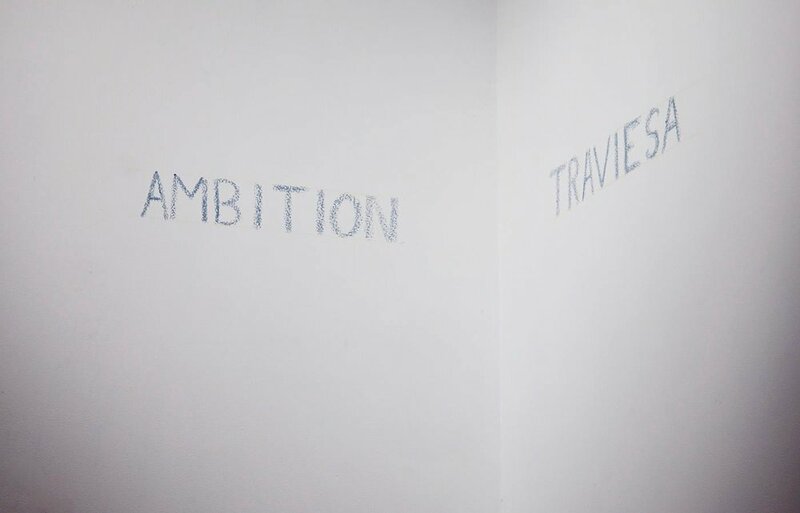 A new installation, Ambition, is being exhibited at The Front during July. The proximity to our nation's birthday gives this piece heightened resonance. New Works by Erica Lambertson is an assortment of new paintings inspired by photographs collected from social media websites. This body of work is in response to the vicarious interpretation of images encountered on the Internet and the perceived importance placed on these images. Speaking to the experience of Internet browsing turning into obsessive voyeurism and the likelihood of misperceiving events and emotions through image bombardment, New Works comes from a place of isolation instigated through social media. 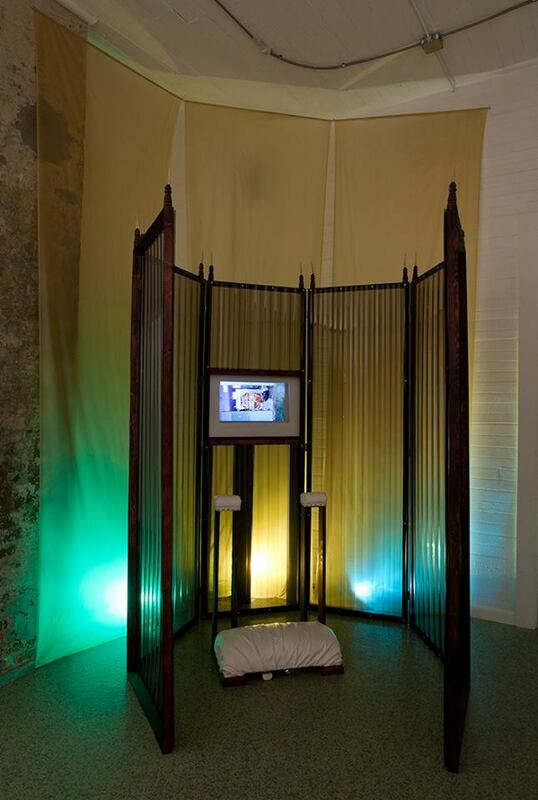 In this installation I play with the ways in which materials and imagery construct a synthetic reality. I orchestrate an illusionary world of symbolic meaning using corrugated siding, construction netting and shower curtains to reflect vivid colors, lights and the allure of plastics. While these are literally synthetic, I also use synthetic in a metaphorical sense to refer to the way in which we create our reality. Creating a space where objects and materials can play emulates our understanding of self and how we perceive objects in our mundane world. Saint Thing is used as a catalyst to transcend the objects’ material reality and allow for the objects to express their inner dialogue. I believe all objects have a desire to be something great in life. I believe we compose an illusory environment to escape the limitations of our physical trappings. We do this as a way to elevate our experience towards something higher. The religious reference serves as a frame to work within the ideas of sacred space and objects. I believe physical environments and the objects that inhabit them can be a vehicle for heightening this tendency, whether it is a religious sanctuary or a dance club. 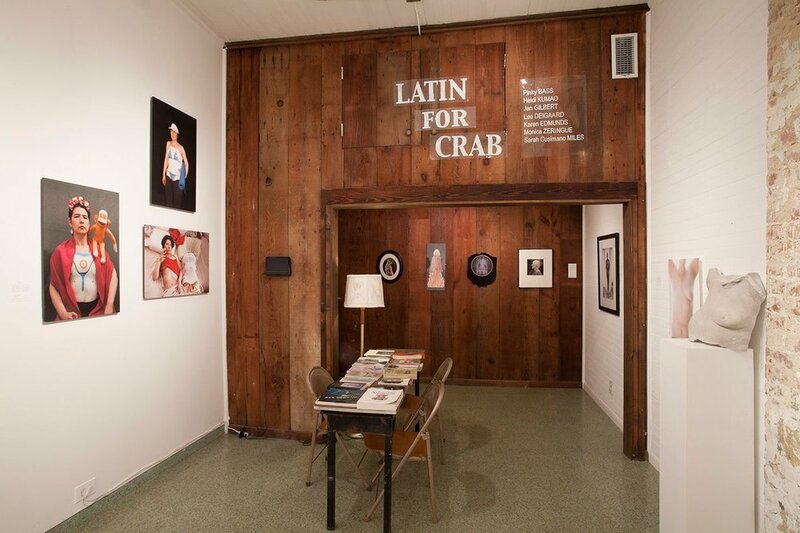 Latin for Crab, a summer group show under the sign of Cancer, considers the female body- its armor, its flesh, bound, determined, embodied- from perspectives of illness, mortality, and recovery. Works in the show derive from artist responses to their own or close associates’ illnesses. Featuring the work of Pinky Bass, Heidi Kumao, Sarah Cusimano Miles, Karen Edmunds, Jan Gilbert, Monica Zeringue, and Lee Deigaard who also curated. With a special viewer browsing section of related texts and picture books, including The Trotula, a medieval compendium of women's medicine.